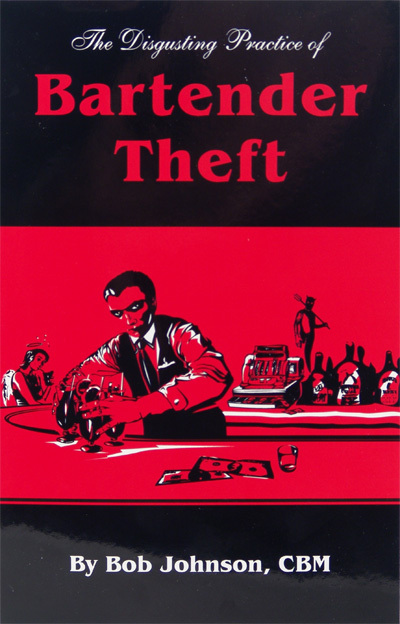 Part 1 of 2: Do Bartenders Steal? Do bartenders steal? I've worked with some outstanding bartenders over the years, men and women who are honest, hard-working, team/family-oriented and loyal. I'd like to think all bartenders are like that, but according to some, I'm misguided. Joe Motzi of Entrepreneur Consultants in New York wrote an article on the subject for Restaurant Hospitality magazine, in which he said: "The theft is incredible! In the past three years we ran across only one bartender who wasn't stealing from his employer. That's out of about 1,000 clients! Only one bartender went by the rules of the house!" Employee Service Reports in Fort Myers, Florida, a surveillance service to restaurants and lounges since 1950, reports that more than 50 percent of bartenders surveyed are not recording sales. That's a polite word for stealing. After weeding out the undesirable employees, the theft problem goes away - at least until after the new hires are comfortable with taking advantage of management. A Michigan bar owner I know fired her last nine bartenders for stealing - in just one year. The owner of the Au Main bar in New York City has filed a $5 million lawsuit against 12 former bartenders and his chief financial officer for "working together (collusion) against the house, not recording drink sales and splitting the money amongst them for the past 8 years". The CFO changed the numbers in the books to cover up the missing inventory. The temptation for a bartender to steal, and the ease of doing it, is scary. Receiving cash each time you sell a drink creates the temptation to keep the money (is anyone watching?). The drink sale is simply not rung up. The money for the drink goes straight into the cash register drawer by hitting "00" (No Sale), or they work out of an open drawer. They keep track of how much they are "over" by using a type of abacus system - 3 match sticks in a nearby empty glass equals $30, or a black sneaker mark on the floor equals $20 (3 black marks and they're up about $60). The bartender takes the "over" out of the cash register drawer before turning in their money. Selling a cup of coffee or a "virgin" daiquiri (non-alcoholic) increases the temptation for bartenders or servers to take that money, too. Most bars do not inventory non-alcoholic type drinks, and most do not require their bartenders/servers to issue a receipt for each sale. While taking from you, there's a good chance they're also cheating your customers. Your bar might feature "tooters", which are 24 shots of liquor served in a one-ounce tube. The bartender is supposed to sell them for a buck apiece, but decides to charge the customer $2 - and pockets $24 at the customer's expense. Of course, the house gets hurt when the customer discovers the scam. The theft process starts when first hired. The bad bartender usually looks for areas where management is lax. They run little "spot tests" - seeing what will work and what won't. Once it's established what works it's full steam ahead. Another type is the overt thief - one who steals openly, thinking no one, including the customer, realizes what he or she is doing. Professional spotters describe this type of bartender theft as "wide open". These people fear no one - customer or management. This is reason enough to use professional surveillance companies, or spotters, routinely. Spotters are hired to watch for, and report, any act of theft by a bartender, waitress, manager, or any employee working on the premises. However, there can be problems with spotters. Many don't understand a bartender's organization, motion, or actual transactions. Many are also "minimum wage plus expenses" employees of a local security company and have never tended a bar before. The best spotter is one who has bar experience and can detect a discrepancy in another bartender's work routines. Bob Johnson is a nationally recognized Beverage Management consultant who specializes in multi-unit management of nightclubs/bars and bartending. He is a 50 year veteran of the bar business and is known for creating America’s first certification program for bar managers, “CBM” (Certified Bar Manager). Mr. Johnson has taught at Florida International University in Miami, Florida, serving as Professor of Beverage Management. A graphic projection lighting system. Also known as a "bat light," this type of system can provide a highly effective way to advertise your bar to passersby. It also looks great when used on the inside of your establishment. Bat lights use a light and optic setup to project your logo or other related graphics onto any surface, including walls, ceilings, the outside sidewalk, and more. They can be purchased or rented for far less than you might think. Signage. From how far away can your bar be seen? If you can't be seen at least a block away, consider increasing your outside signage. While this is not a small expense, there's no point in hiding the fact that your bar is nearby. If you talk to your distributors, you might find that one of them is prepared to subsidize the cost of your signage, in return for mention of their product. Neon works! 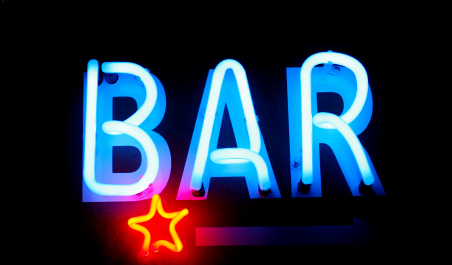 Why do you think every bar has neon beer signs in the window? The answer is simple: because people notice them. An impressive neon sign is a local landmark. Think of those huge neon signs in Times Square and how many tourists know of them and send photos of them home to their family. You don't have to go to quite that scale, but a small investment in neon will bring people in to take a closer look. Don't discount the appeal of a nice paint job. Is your exterior freshly painted? A new paint job isn't just about aesthetics. The outside of your venue is usually assumed to reflect the inside. Consider asking your staff to come in after-hours and paint the walls for you, in return for a bonus. Most bar staff could use a few extra bucks now and then. It'll be a lot cheaper than hiring a professional. Landscaping isn't a luxury. Just as your exterior walls say a lot about your interior, so, too, do your grounds. If all you have outside your venue is a gravel-covered parking lot and a few beat-up pickup trucks, you're not going to attract a broad demographic, no matter what you offer inside. Plant some hardy greenery outside that will survive any weather extremes (choose varieties that will not need constant trimming and watering). This will soften the outside of your bar exterior. A few trees around the outside of the parking lot won't hurt, and some up-lights underneath them can offer a particularly breathtaking look, for not a lot of money. Keep things neat. Remove snow in the winter, have an awning to protect patrons from the elements, and make your entrance attractive to ensure that more people will peek into your bar. Who is greeting your customers? Is someone making them feel welcome right away or are they being greeted only by a suspicious security pterson? Do not give customers an excuse to walk away after they have made it all the way to your bar's door. Make them feel welcomed. Sometimes the only element that separates successful bars from those that fail is in the small professional touches of excellence. This extra effort implies that tremendous thought has been made all around to attain the highest level of quality possible. 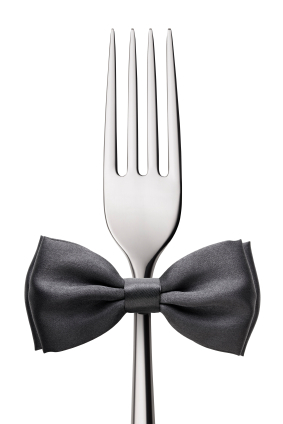 Professional bartenders and courteous cocktail waiters/waitresses can be found in any well-managed restaurant. However, it is the small, un-demanded touches and extra procedures that separate good lounges from superb ones. Described in this section are some simple, inexpensive suggestions that will give your bar the extra touches—the finesse—that will separate yours from the rest. Real napkins and table linens. Fresh ingredients, real fruit juices, and high-quality garnishes. Elegant presentation of drinks—garnishes, fancy napkins, and pretty glassware can turn even ordinary drinks into extraordinary ones. Quality tables, chairs, and seating. Comfort is always appreciated. Entertainment. Giving patrons something to do or something to look at while drinking is appreciated, especially by those customers who arrive alone. Beautiful bathrooms. Many customers judge a bar by the bathrooms. If yours are beautiful, clean, and offer extras such as a sofa and breath mints, your bar will seem all the more impressive and wonderful to your customers. Elegant decor or a unique ambience. Even sipping a beer in a visually exciting place seems more interesting and fun than staying at home. Lights, colors, and artwork can easily create ambience on a small budget. Waiting lines. If there's a line outside the door, all it takes is a little creativity to either bring the line inside or disguise it on the outside. Remember, those people waiting outside are probably thirsty and they'd be more than happy to do their waiting in a courtyard area, at a temporary bar, or in a cordoned-off outside area where drinking is permitted. Of those who are prepared to brave the line, most will do so gladly if they know they can be inside within 30 minutes. Also, it's simple to change waiting-time perceptions by making that wait a little more comfortable or entertaining. Parking can be a big hassle in many venues. If there tends to be a traffic jam outside your venue, consider installing a valet service on busy nights or posting a staff member outside to direct patrons to parking around the back or down the road. Signs pointing to parking areas also help. Offer creative extras. Whether it is free hand massages, glow sticks, or a live band outside, making the outside dazzling will make people all the more eager to see the inside of the bar. Think about your TV screens and sound system in relation to your waiting area. Can waiting people catch a glimpse of the big game? Can they hear the music inside? These things will keep a waiting person keen on staying around, whereas a blank brick wall and a disinterested bouncer isn't inviting to anyone. Keep clientele informed. If there's a wait for a table, set up an electronic sign indicating how long their expected wait will be. Add to this anything you can think of that will make their wait more entertaining—sports scores, trivia questions, coming events. It might be a little more work, but if you can keep just five people from leaving, it'll be worth it. Freebies and incentives. Offer your waiting patrons a little something extra and they won't just "not mind" waiting, they'll do so gladly. Coupons to be used on a later date are a good option. Create a waiting area if you know that there tends to be a wait to get into the bar. This can include comfy chairs or an outside patio where customers can wait and sit. This is a great way to make sure that customers do not get tired and leave. It doesn't have to be expensive. Giving your waiting customers something to do doesn't have to be expensive, high-tech, or take up your employees' valuable time. Consider offering free reading material in your waiting area or even Internet access. Act first. A long wait doesn't seem quite so long when a staff member keeps you informed on how long your table will take. Don't wait for the customer to ask you; go out and tell the customer. Offer free appetizers to waiting patrons. A tray with a nice selection of different foods from your menu can actually be a great advertisement and may even generate increased food sales. Supply your customers with pagers. Offering waiting customers a pager to notify them when their table is ready is a great alternative to the usual "public address" announcement or a yell over the crowd. When a table becomes available, your host simply dials the waiting customer's number, and wherever they are in the building (or outside), they know that their table is ready. Build suspense. If it appears as though there is something really exciting going on in your bar, people will be willing to wait to get inside. Make sure waits are fair. Patrons who have been waiting for a whilewill get rightfully angry if it appears as though the staff are letting in people who are paying extra or who are simply "flirtier." Make sure that your security staff respect the queue and try to get everyone inside in an orderly and fair manner. Keep your customers informed. Be honest. If there'll be a half-hour wait, don't tell them it will be a fifteen-minute wait and hope they don't walk out. Similarly, ensure your staff keeps them updated on the wait so they know they haven't been forgotten. Small things like this make a big difference in the eyes of a waiting customer. Customers are your mainstay in the bar business. If you treat them better than other bars would, you are ensured repeat business. Customers love to feel like VIPs, and the more patrons you make feel like this, the more business you will have. Share these tips with your staff to ensure they treat every customer as through he or she were a star.